Tornadoes are frightening and dangerous weather phenomena, capable of appearing out of a thunderstorm in moments, wreaking total destruction, and vanishing just as quickly. Tornadoes can happen anywhere on earth, but are most common by far in the U.S., especially in the Midwest and South. The storms themselves are dangerous, and dealing with the aftermath can be harrowing. In this article we’ll take a look at these awe-inspiring twisters, learn more about their formation and the threat they pose and then detail some life saving procedures you should use to make sure you survive the next time the sky is dark and you hear that freight train sound coming. A tornado is defined as “a violently rotating column of air that extends from a thunderstorm to the ground and is often, though not always, visible as a funnel cloud”. Often spawning out of violent spring and summertime storms, tornadoes carve a swath of destruction across the countryside. How long and how wide that swath is depends on the intensity of the tornado. Tornado strength is measured on the Enhanced Fujita Scale with a rating of EF0 to EF5, with EF5 being strongest. Though it takes into account many variables, including building damage to certain types of buildings and construction material, the most prominent classifier of the EF scale is the wind speed of the tornado, qualified by a sustained gust of 3 seconds. All tornadoes are dangerous events, but the stronger storms are so destructive, they are in a class all their own. The wind speed and damage output characteristics of the Enhanced Fujita scale is detailed below. Minor Damage: Roofs, gutter and exterior feature damage to buildings; small or shallow-planted trees pushed over; larger trees may lose branches. Significant Damage: Roof material may be stripped from buildings; mobile homes blown over; doors ripped away and windows break. Serious Damage: Roofs ripped away completely from buildings; cars may start to liftoff; houses may shift; mobile homes destroyed; You will see lighter objects turned into dangerous missiles; larger trees may break. Major Damage: Well-built structures partially destroyed; major damage to large structures; cars tossed, heavy vehicles lifted; trains overturn. Wind is strong enough to strip bark from trees. 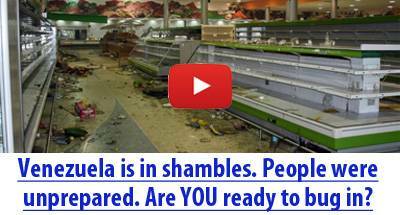 Devastation: Well-built structures leveled; vehicles launched or carried away; severe threat from airborne debris. Catastrophic Damage: Strong structures annihilated; reinforced structures badly damaged; train cars launched. As you can see, even a weak tornado is a serious storm, but anything from an EF2 and up is a major threat, with EF4 and EF5 class tornadoes being major disasters. The latter can completely level an area a mile wide and 50 miles long. To make matters worse, tornadoes and thunderstorms go together like peanut butter and jelly, with lightning, hail and driving rain (and accompanying flooding) accompanying many tornadoes. The rain may also serve to hide a tornado’s distinctive funnel cloud from view, making reacting to an approaching one difficult. A tornado’s passage will subject you and the structure you are in to the most powerful winds you are likely to encounter, battering and toppling houses. Any airborne object, from a piece of straw to a nail-studded board is turned into a battering ram or harpoon, and one of the major causes of harm and death to anyone near a tornado. In the aftermath of all that, assuming you survived its passage, you’ll be dealing with downed power lines, major destruction to buildings with debris strewn everywhere, leaking gas, broken water and sewer lines, and more. Tornadoes are no joke, and as deadly a weather event as anything. The good news is modern weather tracking and communications technology has made reliable early warning a reliable means of preventing human casualties, if not property damage. The National Weather Service issues tornado watches and tornado warnings as conditions evolve and change around weather systems and storms likely to produce tornadoes. A tornado watch is issued by the NWS when weather conditions around an area show an increased risk for patterns that may produce a tornado. Tornado watches may be issued hours in advance of approaching weather systems and storm fronts. A tornado warning is issued when a tornado has been sighted from the ground or on weather radar. If a warning is issued you will have little time to react: The tornado’s arrival is on average only 13 minutes away when a warning is issued, and often much less! Sometimes tornadoes can form with no early warning possible or made. These storms are very unpredictable, and so you should be on “Ready 5” alert anytime severe storms are in your area. It is crucial that you heed these early warnings in order to ensure you have enough time to react to a tornado. Emergency Alert Systems can push alerts directly to your cell phone. The NOAA Weather Radio also issues alerts and monitors developing situations with tornado activity. Both are important tools for maintain your awareness and “reactionary gap” when in tornado prone country or seasons. These services, while valuable, are not infallible or always available. Do not trust to them in exclusion of your senses. Tornadoes have typical warning signs before they manifest. You should learn these signs and be very alert to their presence when bad weather is near. Look at the signs below: one, several or all of them may manifest when tornado has formed or is forming. The iconic and typically funnel cloud is visible. Note this may be concealed by heavy rains around the funnel, or at your location, reducing your visibility. An odd silence and stillness during or after a thunderstorm. If the wind suddenly dies, be alert! This is the literal calm before the storm. Debris falling from the sky. This could be anything from natural material, like dirt, leaves, branches, gravel etc., to man-made things or even animals, like fish or frogs. A haze near ground level accompanying a storm. This ground-effect cloud may be visible even if the tornado itself is not. The sky changes to an eerie greenish-yellow color. While not always present, this color shift is widely reported prior to severe storms and tornadoes in North America. You hear a loud roaring. That freight-train sound is another hallmark of a tornado. If you hear it, it is fairly close. If you detect any or several of these warning signs, or are under a tornado watch or warning, take action immediately! Your best defense against a tornado’s winds is simply getting inside the strongest available structure you can. If you have a basement in your home, go into the basement. If you don’t, go into the smallest most centrally located room in the house. Avoid rooms with windows if at all possible. Take care to cover yourself with anything that could provide padding or protection from falling or windblown debris. Helmets can provide protection to the head as well. Mobile homes and campers are no defense against a tornado. Neither are cars, sheds and outbuildings. Large buildings with roofs that run over a long span are specifically vulnerable to tornadoes. If inside one of these structures when a tornado hits, you should head to the smallest room possible if it does not have a specifically constructed room for storm protection. If you are caught in the open or car when a tornado strikes you will have to take your chances by either getting in a ditch or hunkering in the car. Neither is anything close to decent protection. Whichever you choose, ignore the conventional wisdom that has long advised you to take shelter under an overpass or bridge; these areas intensify winds and funnel debris into a deadly fusillade. For either option, take care to cover your body with anything that can offer padding and protect your head. Windblown debris is the major killer in this situation. Reinforcement of your existing dwelling is an idea that has merit, but doing so is often very expensive and time consuming. Homebrew solutions like adding steel plating to walls to help defend against flying debris is a fair idea, but the weak point is the attachment system; the steel will only be as strong as the fasteners securing it. A more cost effective solution would probably be to simply dig in and install a purpose made underground shelter, even if it is small. Above ground is a bad place to be during a tornado in any but the most hardened buildings. If installing a purpose-made shelter unit is out of financial reach, you might try building in a small reinforced shelter under your basement steps to give you protection from debris in case the upper floors of your home are swept away. The very best place to be during any tornado is in FEMA safe room or International Code Council (ICC) 500-rated storm shelter. These structures are designed to provide near-total protection from even the most cataclysmic storms. Locating and getting into these structures around your locale is a top priority in your preparation, which we will discuss in a bit. One more thing: it is vital that you do not attempt to leave a shelter in an attempt to reach a better one when a tornado warning is active. Tornadoes are dangerous far beyond the physical funnel itself, and they move rapidly and unpredictably, not to mention that where one tornado spawns more can follow. Being overtaken on foot or in a vehicle by a tornado is the worst possible outcome. You will likely not survive. Your preparation for a tornado will consist of gathering supplies and equipment to both protect you during the storm and help you sustain and shelter afterward, as well as logistical planning involving locating designated shelter and hardened structures in your community. If you accomplish both, and make it a point to practice your response to watches and warnings your chances of dying in even a severe tornado are very slim. Keeping supplies in your BOB or a dedicated bag in your shelter locations at home and work is a wise idea, or keeping it in a readily accessible part of your home if you intend to head toward a better shelter. Pet Supplies (if you have a pet) Can or two of food, collapsible water bowl, muzzle, long spare leash and harness. All of this will be very handy in the aftermath of the tornado, for reasons we will explore in the next section. That brings us to our next most vital preparation: assessing your locale’s overall tornado threat and ID’ing the best shelters near your home, workplace and anywhere else you may frequent. Tornadoes can occur anywhere on earth, but are very common east of the rocky mountains in the U.S., predominately in the Midwest, Plains States and South. “Tornado Alley” is an often cited region stretching from central Texas north to the fringes of South Dakota. A large fraction of all tornadoes in the U.S. occur in this region. If you live in one of these areas, and are able or wanting to move, vacating will significantly reduce your risk from tornadoes. 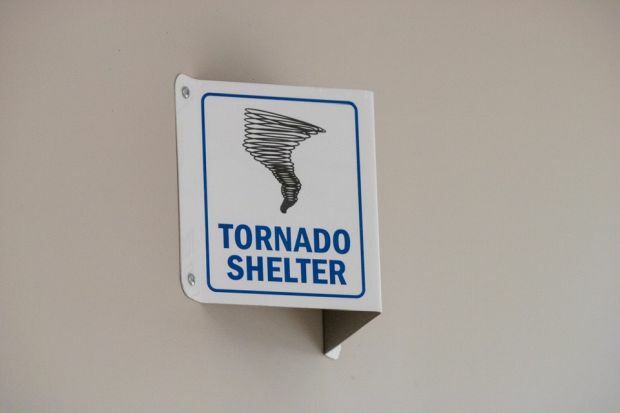 If you don’t want to leave a tornado-prone area, you must take extra precaution to locate and become familiar with the best shelter locations in your area. 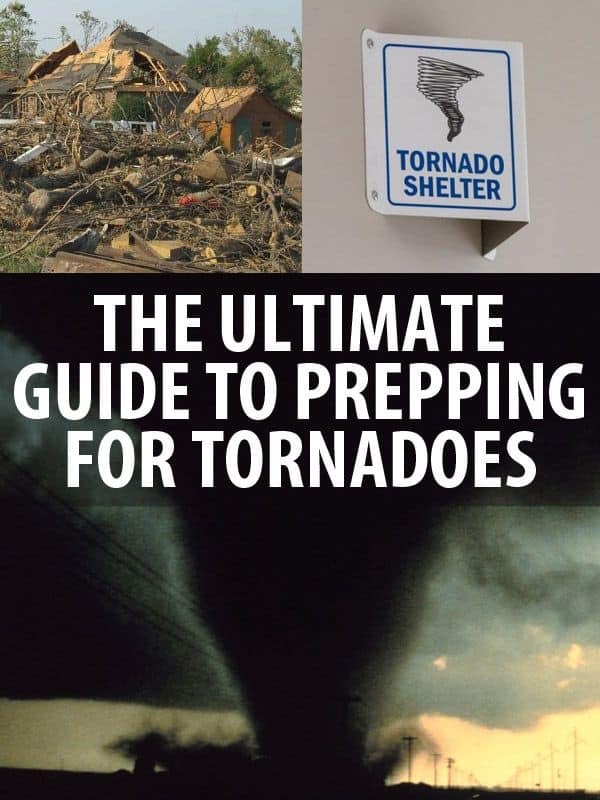 The FEMA and ICC rated shelters mentioned earlier are your very best option for surviving a tornado, and it is doubly important that you know where they are and how to get to them as quickly as possible. Being inside one of them could mean the difference between life and death in a direct hit. Once you have your supplies gathered, packed and staged, take the time to drill and practice your response to watches and warnings being issued. If a watch is issued, make it a point to rally your family members, and stash any needed supplies in your shelter location if not already kept there. If time permits, change into clothes suitable for work that have some protective quality. Treat this as a timed exercise, with the objective being readiness to take cover in just a few minutes. To deal with a warning, you should practice getting yourself and family into an appropriate shelter as rapidly as possible. Remember, you might only have moments or a few minutes before a tornado arrives after a warning is issued. You may also choose to practice driving as quickly as possible to a suitable shelter location if your house or current location is unsatisfactory. You should plan for blocked roads or traffic to hamper your route, and have Plan B and C in place for alternate shelter locations. Take care if driving to safety is part of your response plan, as you may have very little time to react to an approaching twister. Think carefully and assess all information before deciding to go wheels-up. Being caught in a vehicle is one of the worst outcomes possible during a tornado. 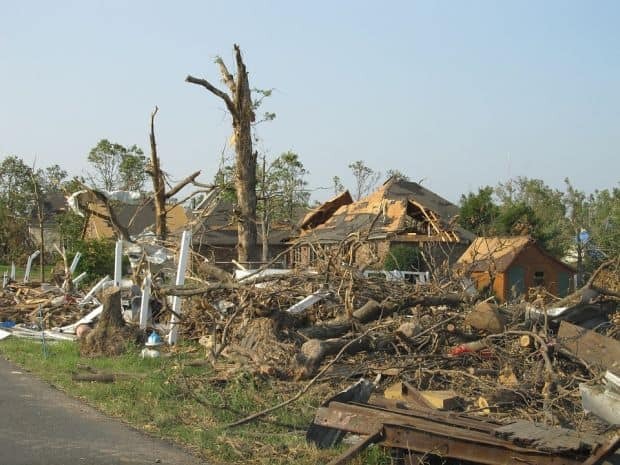 The aftermath of a tornado can be very dangerous, with principal hazards being contact with sharp debris, downed power lines, gas leaks and explosions and chemical spills. Another hazard is dust inhalation from all the destruction of buildings. There is a general order of operations to follow when evacuating or leaving your shelter after a tornado. First, if you smell gas or any other flammable material do not create sparks or activate your flashlight! An explosions and subsequent fire is the last thing you need. Use your chemlights instead for lighting. If you have opportunity, don your change of clothes, boots, gloves, helmet and dust mask. Buildings shift during tornadoes and could be unstable, and stepping on sharp debris is a constant risk after any major storm event. If you are trapped in your shelter, keep talking to a minimum to avoid breathing in dust. Use your signaling device or tap on an exposed pipe or piece of metal to signal for rescue. If your phone is intact and charged, send texts. Count on phone calls working erratically if at all. Damage to cell networks from the storm is probable, and it being swamped with calls if intact is a certainty. When clear of the shelter, avoid any downed power lines no matter how they appear. Again, stay alert for contact with sharp debris. If anyone is injured and you are able to render aid, do so, but remain vigilant for head and neck injuries. Do not attempt to move a downed victim unless they are in immediate danger. When it is safe to do so, fire up your emergency radio or check for an internet connection to receive updates from authorities about rescue, relief and cleanup efforts. Use extreme caution when entering any damaged building. Your water and food rations should last you more than long enough for relief efforts to reach your location, or you get to them, as even severe tornados are localized event when compared to colossal storms like hurricanes and blizzards. Your provisions should be used to maintain energy levels and keep morale up during the hard work of digging out and looking for survivors if applicable. A water filter and other purification methods are smart to have since significant damage to local water supplies are likely, and you might be able to process found water to your or someone else’s benefit. Lastly, in the event that the rain keeps coming and you are stuck in a compromised shelter or out of doors, you can rig up a hasty shelter with your tarp and cordage and utilize your flashlights and chemlights for signaling or marking your family/group in the dark. State and federal aid is usually quick to respond after a tornado, so your efforts post-event should be focused on staying safe and sheltered or assisting survivors if applicable. Tornadoes are violent and terrifying storms, but a keen ear for warning signs and being quick to enter the best shelter possible will see you safe form all but the most cataclysmic twisters. Having the right supplies close at hand will help you and yours stay warm, safe and fed in the aftermath. No matter how bad the destruction is, you can always rebuild and replace. You cannot replace a life lost. Be prepared!